Grown using sustainable growing practices, natural organic fertilizers and no pesticides nor chemical products. Barva Estate Natural: Lively, very fruity with a heavy floral note - rich and full bodied - with a more intense flavor than other Costa Rican coffees because it is a natural coffee. Coffee Drying in the Sun & Hulls (in the background) Which Will be Used as Fertilizer on the Farm© Barva is in the smallest province of Costa Rica, Herediá, which lies in the northern central part of the county and is bordered by Nicaragua in the north. Barva, 25 km north of San Jose, is located on the lush and green fertile slopes of the extinct Barva Volcano just next to the Poás Volcano, above the Central Valley. The word ‘Barva’ comes from the name of a local Indian tribal chief ‘Barvac’ who used to rule the area before the Spanish arrived. One of the first towns to be colonized, Barva is surrounded by coffee plantations and coffee cultivation is this town’s main industry. The love of coffee and it’s production is part of a generations old heritage of the region. The men who make up each crew are the backbone of the estates and have spent their lives learning their trade. In almost every instance they come from families that have generations of coffee experience. Growing coffee is a delicate business, with plenty of hard physical labor and because of the steep terrain it is often dangerous work. Hand Crafted on Barva Estate for the best beans. All coffee beans are shade grown, handpicked and selected for only the ripest/reddest berries, hand picked, sun-dried as natural coffee, selected for the hardest beans, hand milled, packed & shipped directly from the Estate to the roaster. When the coffee is processed and packed on an Estate, you are assured of pure regional coffee, not a blend or mix of coffees from several farms! Barva Estate Natural Coffee is shade grown using sustainable growing practices, natural, organic fertilizers, weed control is done by hand with machete and no herbicides nor chemical pest control are used! 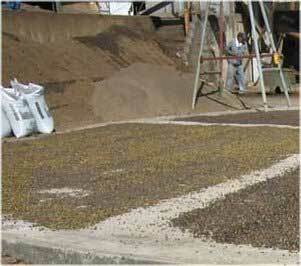 The Dry Method is used for processing the coffee. * The coffee husk generated in coffee processing and the vegetable matter generated by weed control are recycled as fertilizer for the coffee. Fresh Roasted: We typically roast your coffee within 24 hours of shipping. This way you received the best coffee for your cup possible! Packaged in 8 ounce, heat sealed, high quality, heavy duty, stand up bags with one way valves for absolute freshness; with no premium charge for the smaller bags, so you can open a bag of fresh coffee more often. Cafe Cortez is a 3rd generation Costa Rican coffee company. The family has known and loved coffee and the land since birth. This honor of their land and country have let them to respect and protect the environment and use sustainable growing practices as well as respect their workers, consider them more partners than employees, and pay them a fair wage, as reflected in their More Than Fair Certification.